Northwest Airlines Corp. (abbreviated in initials as NWA; stylized in all lowercase) was a major United States airline founded in 1926 and absorbed into Delta Air Lines, Inc. by a merger. The merger, approved on October 29, 2008, made Delta the largest airline in the world until the American Airlines-US Airways merger on December 9, 2013. Northwest continued to operate under its own name and brand until the integration of the carriers was completed on January 31, 2010. Northwest was headquartered in Eagan, Minnesota near Minneapolis-St. Paul International Airport. After World War II it became dominant in the trans-Pacific market with a hub in Tokyo, Japan (initially Haneda Airport, later Narita International Airport). After acquiring Republic Airlines in 1986, Northwest also established major hubs at Detroit Metropolitan Wayne County Airport and Memphis International Airport. In 1993 it began a strategic alliance with KLM and a jointly coordinated European hub at Amsterdam Airport Schiphol. The Detroit and Minneapolis operations were retained as Delta hubs. However, the Memphis operation peaked at more than 300 flights per day prior to the merger with Delta. Prior to its merger with Delta, Northwest was the world's sixth largest airline in terms of domestic and international scheduled passenger miles flown and the US's sixth largest airline in terms of domestic passenger miles flown. In addition to operating one of the largest domestic route networks in the U.S., Northwest carried more passengers across the Pacific Ocean (5.1 million in 2004) than any other U.S. carrier, and carried more domestic air cargo than any other American passenger airline. Regional flights for Northwest were operated under the name Northwest Airlink by Mesaba Airlines, Pinnacle Airlines, and Compass Airlines. Northwest Airlines was a minority owner of Midwest Airlines, holding a 40% stake in the company. Northwest Airlines' tagline was "Now you're flying smart." Its frequent-flyer program was called WorldPerks. Northwest Airlines was founded on September 1, 1926, by Colonel Lewis Brittin, under the name Northwest Airways, a reference to the historical name for the Midwestern United States that derived from the Northwest Territory. Like other early airlines, Northwest's focus was not in hauling passengers, but in flying mail for the U.S. Post Office Department. The airline was originally based in Detroit, Michigan. The fledgling airline established a mail route between Minneapolis and Chicago, using open-cockpit biplanes such as the Curtiss Oriole and the Waco JYM. From 1928 the enclosed cabin six-passenger Hamilton H-45 and H-47 were used. Northwest Airlines began carrying passengers in 1927; in 1928 Northwest started its first international route with service to Winnipeg. In 1929, a group headed by Richard Lilly, a businessperson from St. Paul, Minnesota, purchased the airline. In 1933 Northwest airlines was selected to fly the "Northern Transcontinental Route" to Seattle, Washington. It adopted the name Northwest Airlines the following year after the Air Mail scandal. Northwest Airways, Inc. changed its name to Northwest Airlines, Inc. and the airline was incorporated under its new name in the State of Minnesota. In 1939 Northwest had five daily flights from Chicago to Minneapolis; three continued west to Seattle through North Dakota and Montana. Northwest also served Winnipeg, Manitoba and Portland, Oregon by spurs from its transcontinental route. Northwest Airlines common stock began to be publicly traded in 1941. In 1931 Northwest sponsored Charles and Anne Lindbergh on a pioneering test flight to Japan via Alaska, scouting what would become known as the Northwest Airlines' Great Circle route that could save 2,000 miles (3,000 km) on a New York to Tokyo flight. Northwest developed this route during World War II, when it flew soldiers and supplies from the Northwestern United States to Alaska; Northwest began painting its airliners' tails bright red as a visual aid in the often harsh weather conditions. The airline's experience with the sub-arctic climate led the U.S. government to designate Northwest as the main airline over the North Pacific following the war. In spring of 1947 Northwest began stationing employees at Haneda Airport in Tokyo, flying them from the United States via Alaska on its Great Circle route. On July 15, 1947 Northwest was the first airline to begin direct service between the United States and Japan, using a Douglas DC-4 airliner named The Manila. (All pre-war airline service to the Orient had been via Hawaii and the Philippines.) The flight to Japan originated at Wold-Chamberlain Field in Minneapolis and stopped at Blatchford Field in Edmonton, Elmendorf AFB in Anchorage, and Shemya AAF in the western Aleutian Islands. The flight continued from Tokyo to Lunghwa Airport in Shanghai and then to Nichols Field at Manila. A flight between Tokyo and Seoul (Gimpo Airport) began on October 20, 1947, and Naha Airport in Okinawa began to be a stop on the Tokyo to Manila route on November 16, 1947. Northwest service to Shanghai was suspended in May 1949 because of the civil war in China, with the Republic of China nearly ready to collapse, and its government evacuated to the island of Formosa (Taiwan). Northwest Airlines added Songshan Airport in Taipei, the new capital city of the Republic of China, as a stop on the Tokyo-Okinawa-Manila route on June 3, 1950, with ongoing interchange service to Hong Kong operated by Hong Kong Airways. With transpacific flights established, Northwest began branding as Northwest Orient Airlines, although its registered corporate name remained "Northwest Airlines." NWA continuously upgraded equipment on the transpacific routes. On June 22, 1949, Northwest received its first double-decker Boeing 377 "Stratocruiser", enabling more comfortable accommodations and faster transpacific flights. The Stratocruiser began flying from the West Coast to Honolulu in 1950 and to Tokyo via Alaska on September 27, 1952. In 1954 Northwest Orient purchased DC-6Bs and started flying them to Tokyo and Manila. On July 8, 1960 Northwest placed the Douglas DC-8 into service, offering the shortest flight times to East Asia, but within a year the airline was negotiating the sale of the five DC-8s. Northwest retired the last of its Boeing 377 Stratocruisers that September. 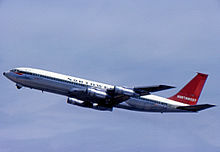 The airline purchased several Boeing 720Bs in 1961, and in 1963 several new Boeing 707-320Bs; for a time it adopted the slogan "Northwest Orient: The Fan-Jet Airline". Nonstop transpacific flights became feasible with the introduction of the 707-320B/C. Northwest bought its first Boeing 747s in 1970 and soon began retiring its smaller 707s. Besides transpacific flights, for a time Northwest flew 747s on its busiest domestic routes. For years Northwest was the largest foreign airline serving Japan. In 1951 Northwest became involved with the founding of Japan Air Lines (JAL) by leasing airliners and crewmembers to the new airline. In 1952 United States and Japan ratified a regional bilateral aviation treaty, under which Northwest and Pan American World Airways became the two U.S. airlines at Tokyo. These carriers also received fifth freedom rights to carry passengers from and via Tokyo to other Asian destinations such as Seoul, Taipei, Manila, Hong Kong, Bangkok and Singapore. Northwest also flew passenger routes from Japan to Guam and Saipan, U.S. possessions in Micronesia. Northwest's meteorologists, led by Dan Sowa, pioneered the first clear-air turbulence forecasting system in 1957, important since the airline flew many northern routes over turbulence-prone mountain areas. Northwest remained a leader in turbulence prediction, providing TPAWS (turbulence prediction and warning services) to other airlines. During the regulated era, Northwest's domestic network was mainly along the northern transcontinental route through Chicago, Minneapolis and Seattle; New York and Detroit were added in 1945. Northwest also served Hawaii from the West Coast, and, starting in 1958-59, Georgia and Florida from Chicago. On June 1, 1959 Northwest accepted its first turboprop, the L-188 Electra, from Lockheed. Northwest Airlines started flying the three-engine Boeing 727 in November 1964; many stretched 727-251s followed. After airline deregulation in 1978 Northwest began nonstop flights to other Asian cities, returned to China in 1984 after a 34-year hiatus, and strengthened its presence in the southwestern United States. It also began flying to the United Kingdom, Ireland, Germany, and Scandinavia. 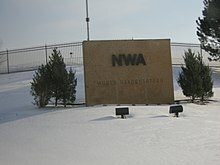 On May 21, 1984 shareholders in Northwest approved the creation of NWA Inc., a Delaware corporation that became the holding company of Northwest. On October 1, 1986, Northwest merged with Republic Airlines, also based in Minneapolis-St. Paul. It was the largest airline merger until then and caused operational issues which led the combined carrier to have an on-time performance of just 42 percent in its early days. Through the merger, NWA adopted Republic's three-hub domestic network centered around Minneapolis-St. Paul, Detroit, and Memphis. The combined airline became particularly strong in the first two cities, with a market share of over 80% in each. After the merger, the airline dropped Orient from its branding. One major reason for the merger was that Northwest's unique position as a domestic and transpacific carrier had been challenged in 1985 when United Airlines acquired the Pacific Division of Pan Am. Northwest continued to use the pre-merger Northwest Orient livery (minus the word "Orient") until a new livery and identity (designed by Landor Associates) were adopted in 1989. The new livery, nicknamed the "bowling shoe" by employees, featured colors of red, white, gray, and black. Also in 1989, Northwest became the launch customer of the Boeing 747-400 and became of only one of 2 airlines in the United States to operate it until its merger with Delta in 2009. Coincidently, the first aircraft it brought was the first 747-400 ever built. it was later involved in a near accident in 2002 was later retired by Delta in 2015 and given to its museum. Northwest was purchased in a 1989 leveraged buyout by an investment group headed by Al Checchi, Fred Malek and Gary Wilson, with KLM, and many others. To pay off the debt incurred, the new management sold many of the airline's aircraft to leasing companies, and sold property around the world, including land in central Tokyo. The expense of the buyout was so great that in 1993, following several years of losses due to industry overcapacity and a traffic downturn following the Gulf War, Northwest threatened bankruptcy unless its employee groups agreed to three years of wage cuts. After signing the concessionary agreements, Northwest made its first profit since 1989. Also in 1993, Northwest began its strategic alliance with KLM, which was the largest airline partnership until then. This partnership eventually became the Wings Alliance, but the alliance never grew beyond the two airlines. Northwest gradually pulled out of its minor European destinations and focused on domestic and Asian markets. On May 1, 1996 Northwest inaugurated the first ever nonstop service from North America to China, Detroit–Beijing. Nonstop Detroit-Shanghai service followed in April 2000. Later, these nonstop services were suspended in 2002 due to the outbreak of severe acute respiratory syndrome (SARS). Northwest then served these routes via Tokyo. The airline sought government approval to restore nonstop Detroit-Shanghai service in March 2007 but lost its bid to United's Washington Dulles-Beijing route; however, before their merger with Delta Air Lines, Northwest received tentative authority to restart nonstop Detroit-Shanghai service starting March 25, 2009. Through the late 1990s and early 2000s (decade), Northwest enjoyed profits and focused on improving technology to increase convenience and reduce costs. The airline offered airport self-service check-in kiosks starting in 1997, and had more than any other airline. Northwest was the first large U.S. airline to offer passengers internet check-in, with service from December 2000. During the early 2000s (decade), Northwest acquired a reputation of refusing to adopt industry-wide fare increases that had been accepted by other airlines. This changed in March 2005, when Northwest adopted fare hikes in response to rising oil prices. Due to competition from low-cost carriers such as Southwest Airlines and increased labor costs resulting from a new contract with employees represented by the Aircraft Mechanics Fraternal Association (AMFA) labor union, Northwest began to make cutbacks in early 2001. Two small rounds of employee layoffs and other cutbacks were implemented in the months prior to the September 11 terrorist attacks. Following the attacks, Northwest was forced to make dramatic changes to its business structure through major employee layoffs and other cost cutting measures. The retirement of costly and aging aircraft such as the Boeing 727 and McDonnell Douglas DC-10-40 were accelerated as new aircraft went into service. In addition, the airline pursued options to reduce costs across the board, including removing pillows, peanuts, pretzels, in-flight entertainment on domestic flights, and newspapers and magazines. Over 50 McDonnell Douglas DC-9, Boeing 757, Boeing 747, and Airbus A320 family aircraft were withdrawn from use in an attempt to lower overall capacity and save money. Some of these aircraft were returned to service. Following many years of a pioneering and close partnership with KLM Royal Dutch Airlines, Northwest, along with partners KLM and Continental Airlines joined SkyTeam, an airline alliance of ten airlines from around the world, on September 15, 2004. This was partially a result of Air France acquiring KLM, forming the Air France-KLM group. The airline continued to hemorrhage money, however. Despite far-reaching money saving initiatives, Northwest was forced to file for Chapter 11 bankruptcy protection for the first time in its 79-year history. The filing took place in the U.S. Bankruptcy Court for the Southern District of New York on September 14, 2005. With Northwest's filing, four of the six largest U.S. carriers were operating under bankruptcy protection. Northwest joined Delta Air Lines (which filed just minutes before), United Airlines, and US Airways in bankruptcy. All four carriers subsequently emerged from bankruptcy protection. Northwest common stock shares dropped more than 50% for the second time in three days following the news, largely because stock is generally canceled as part of the bankruptcy process. In the following weeks, Northwest Airlink carriers Mesaba Airlines and Pinnacle Airlines both announced that Northwest Airlines had missed payments to them for their Airlink flying. Northwest also announced plans to shrink its Airlink fleet by over 45 aircraft. Mesaba Aviation filed for Chapter 11 Bankruptcy on October 13, 2005. A320-212 at San Jose in Northwest's final livery (2003-2010) before its closure. Northwest announced on May 18, 2007, that shares of the company would begin to trade on the NYSE under the ticker NWA. Initial trading on a "when-issued" basis began on May 21, 2007, and regular trading began on May 31, 2007. Also on May 18, 2007, Northwest Airlines was cleared by a federal bankruptcy judge to emerge from Chapter 11 Bankruptcy protection on May 31, 2007, ending Northwest's 20 months of difficulty trying to slash costs. On July 16, 2007 Northwest Airlines applied to the United States Department of Transportation for nonstop service between its WorldGateway hub at Detroit to Shanghai (beginning in 2007 on Boeing 747-400s) and to Beijing (beginning in 2010 on Boeing 787 Dreamliners). The airline faced off against Delta Air Lines (who proposed Atlanta to Shanghai and Beijing), American Airlines (Chicago/O'Hare—Beijing), Continental Airlines (Newark—Shanghai), US Airways (Philadelphia—Beijing), United Airlines (Los Angeles—Shanghai and San Francisco—Guangzhou), and MAXjet (Seattle—Shanghai) in the route competition. On August 12, 2007, Northwest Airlines became a passive investor in the purchase of Midwest Airlines by TPG Capital. The airline stated that while it was an investor, it would not participate in any management or control of Midwest Airlines. However, on August 14, 2007, AirTran Airways raised their offer for Midwest to $16.25 a share, 25 cents more than the TPG offer. But soon after on August 17, 2007, TPG Capital raised their offer to $17.00 a share which sealed the deal. Northwest Airlines became a minority owner of Midwest Airlines in the fourth quarter of 2007. On September 25, 2007, Northwest Airlines received DOT approval to begin service to Shanghai from its Detroit hub beginning March 25, 2009. American, Continental, Delta, and US Airways also received new or additional China route authority to Shanghai or Beijing, and United received authority to serve Guangzhou. On April 14, 2008, Northwest Airlines announced that it would be merging with Delta Air Lines to form the world's second largest airline. The merger was approved on October 29, 2008. The CEO during the merger of Delta and Northwest was Richard Anderson who was Northwest Airlines CEO from 2001 to 2004. The combined airline uses the Delta name and branding. On October 1, 2009, Northwest WorldPerks merged into SkyMiles. On January 31, 2010, Delta completed the merge of the reservation systems and discontinued using the Northwest name for flights. The official last flight was Northwest Airlines Flight 2470 from Los Angeles, California to Las Vegas, Nevada. As of 2006, Northwest Airlines Cargo was the largest cargo carrier among U.S. combination passenger and cargo airlines. NWA Cargo's fleet of dedicated Boeing 747 freighter aircraft flew from some key cities in the United States and East Asia, as well as Amsterdam, connecting with the carrier's cargo hub in Anchorage, Alaska (Ted Stevens Anchorage International Airport), facilitating the quick transfer of cargo between large cities on both sides of the Pacific. NWA Cargo also transports freight aboard the passenger fleet of Northwest Airlines to more than 250 cities worldwide. Delta announced that the NWA Cargo hub will be shut down by the end of 2009. As of early 2008, NWA's largest cargo client was DHL International. In December 2007, NWA announced that DHL International would terminate its cargo agreement with the airline effective late 2008. According to NWA Chief Financial Officer Dave Davis, the loss of its largest cargo client would bring significant changes to the division. Further changes to the NWA Cargo division continued into 2009 as it was merged into the Delta Cargo service. NWA Cargo ended all operations on December 28, 2009. On July 30, 2010, Northwest pleaded guilty to one count of felony price fixing for fixing prices for cargo shipping via NWA Cargo. Immediately before Northwest ceased being an independent airline, its headquarters was in Building A, a facility in Eagan, Minnesota, near Minneapolis-St. Paul International Airport and the intersection of I-35E and Interstate 494. The 266,899-square-foot (24,795.7 m2) building in the complex, which housed about 1,000 Northwest employees, was built in 1985. The building had a large "N" painted on the roof. After Delta and Northwest merged, Delta moved the Eagan headquarters employees to other offices in the Minneapolis–Saint Paul area. In October 2009 Delta Air Lines hired a real estate broker to put the 108-acre (44 ha) former Northwest Airlines headquarters complex for sale or for lease. During that month the facility had a taxable value of $13.7 million ($15999270.98 when adjusted for inflation). The airline marketed 36 acres (15 ha) of the former NWA facility that are located along Interstate 494 separately from the main part of the property, as the airline considered the property to be excess. Terry Kingston, the executive director of the real estate brokerage firm Cushman & Wakefield, stated that there had been some interest in the Northwest Airlines property from other parties. Northwest was the only occupant of the four story headquarters building. Employees remaining in the Minneapolis area were moved to Building C, the former Republic Airlines headquarters building, located on the property of Minneapolis-St. Paul International Airport, as well as Building J located in Eagan. Before the headquarters were in Eagan, they were on the grounds of Minneapolis-St. Paul International Airport. A recurring issue in Northwest's history was its troubled labor relations. In 1998, Northwest walked away from the bargaining table, locked out its pilots (represented by the Air Line Pilots Association, International) and shut down the airline for more than two weeks. The airline sustained heavy losses as a result, and ended 1998 in the red, after being profitable since 1993. On January 5, 2000, Northwest Airlines filed a federal lawsuit against the flight attendants' union and a number of rank-and-file employees. Along with its January 5 complaint, Northwest Airlines filed a motion for discovery, requesting searches of the hard drives of the office and home computers of union officials. Additionally, Northwest requested searches of the home computers of rank-and-file employees, including Kevin Griffin and Frank Reed. On February 8, Minnesota District Court Judge Boylan approved the request and issued the discovery order. The order required all 43 named defendants, officers and rank-and-file members to turn over both home and office computer equipment to the accounting company Ernst & Young for "purposes of examining and copying information and communications contained on the computer hard drives." The order permitted the discovery of all data, including e-mail communications. After conducting discovery, Northwest Airlines fired over a dozen employees in early March, stating that they had engaged in a sickout. The Union filed grievances claiming none of the employees' sick calls were false. The effect on intra-airline email use was marked: postings critical of Northwest Airlines by employees dwindled, and the majority of messages after the search were posted anonymously. On August 20, 2005, after months of negotiations, an impasse declared by the NMB and a 30-day cooling off period, the over 4,750 Northwest aircraft mechanics, janitors, and aircraft cleaners represented by AMFA went on strike against the company. After numerous negotiation sessions, no agreement was reached, and the company began hiring permanent replacement workers. In mid-October, after permanently hiring about 500 non-union workers, Northwest made a final offer to the union. The offer would have saved 500 union jobs and offered four weeks of severance pay to terminated employees. This offer was worse than the original declined by the union, which would have saved over 2,000 jobs and offered 16 weeks of severance pay. On October 20, 2005, AMFA announced that it would not allow its members to vote on the offer, citing that parts of the contract would violate the union's commitment to its members. Finally, in late December 2005, Northwest made what it termed its "final offer" to the union. The agreement would have terminated all striking workers and given them rights to unemployment compensation. The union voted down the offer. On October 9, 2006, AMFA leadership and Northwest reached an agreement. Under the settlement, all AMFA workers still on strike as of that date will be converted to lay-off status with 5 weeks of severance pay (10 weeks if they resign from Northwest). However, these employees will have a right of recall to their old jobs. Approval of the settlement was on November 6, 2006. On May 30, 2007, it was announced that the flight attendants narrowly agreed to concessions and became the last major work group at Northwest to agree to new contract terms. The deal was approved by a vote of 2,966 to 2,862. Union leaders said that 90.5 percent of eligible voters cast ballots. The new contract would provide Northwest with $1957 million in annual cuts through 2011. Negotiations with attendants had been ongoing and contentious for several years. The flight attendants were unable to strike during negotiations because of a court injunction and the refusal of the mediation board to release them from bargaining which would have allowed the setting of a strike deadline. The attendants had been working under imposed pay cuts and work rules since July 2006 when a previous tentative agreement was rejected by 55 percent of the voting members. Prior to the May 2007 agreement, union leaders had expressed concern that its defeat could prompt the National Mediation Board to recess talks indefinitely, resulting in the loss of a $182 million bankruptcy claim the attendants had against Northwest. With the new agreement, the $182 million claim was to eventually be sold for cash with an estimated pre-tax value of $15,000 to $18,000 per flight attendant. Other labor unions at Northwest received similar claims as part of their concessionary agreements. Previous to the recent agreements, Northwest provided employees with stock in exchange for concessions. For example, In 1993 Northwest's pilots, ground workers and flight attendants received stock and seats on the board of directors in exchange for pay cuts. As part of the agreement, Northwest was supposed to buy back these preferred shares in 2003 but refused to do so citing financial distress. Flight attendants, ground workers and mechanics still holding those preferred shares received shares of new Northwest stock (estimated at a combined value of $277 million). In the summer of 2007, Northwest was engaged in a labor conflict with its pilots over the large number of end of the month flight cancellations. The pilots claimed that Northwest did not have sufficient pilots to fly its schedule; Northwest accused the pilots of calling in sick to create the problem. The dispute was resolved with a new agreement with ALPA in August 2007 in which pilots would be compensated for overtime. Northwest also began hiring new pilots to alleviate the pilot shortages they faced throughout the summer of 2007. Following the Republic merger in 1986, Northwest primarily operated on a hub and spoke route system with hubs in Detroit, Memphis, Minneapolis/St. Paul, and Tokyo. Under the KLM joint venture, started in 1993, the two carriers established an Amsterdam hub where transatlantic routes operated by Northwest linked with European, African and Asian routes operated by KLM. Northwest also operated a few routes outside this hub system, such as flights from the west coast to Honolulu. In the mid-1980s, Northwest operated the only U.S. flag carrier service to Glasgow, Oslo, and Stockholm, as well as service to Copenhagen. However, this was later withdrawn after several years. From April 2000, Northwest operated non-stop flights from Detroit to Milan and Rome, both were later withdrawn (from 2003 to 2005 Rome was served only during the summer season). In 2009 under the banner of Delta, service to Rome was then resumed for the summer season. In 1991, Northwest began service to Australia, after United and Qantas began non-stop flights to the continental U.S. using the newly introduced, long range 747-400. Northwest routed its Sydney-New York flight through Osaka, which raised Japanese protest because less than 30% of passengers on the Australia-Japan segment were originating in the U.S.
On 1 May 1996, Northwest began the first ever non-stop service from North America to Mainland China, from Detroit to Beijing, three times a week. From 1996 until 2002, Northwest operated nonstop flights from its Detroit hub to Beijing and Shanghai. Eventually, these routes were suspended. When that happened, Northwest operated these routes from Detroit with a connection at its Tokyo-Narita hub. However, on July 16, 2007, Northwest re-applied with the US Department of Transportation for nonstop service between Detroit and both Beijing and Shanghai. On September 25, 2007, the US Department of Transportation tentatively awarded authority to Northwest for a new Detroit to Shanghai (Pudong) route effective March 25, 2009. The route was to be flown using the Boeing 747-400 until the Boeing 787 Dreamliner aircraft became available, however, the Detroit-Shanghai nonstop route was taken over by Delta on October 24, 2009, using its Boeing 777-200ER and Boeing 777-200LR aircraft after Delta ended nonstop service between Atlanta and Shanghai due to weak customer demand. The Detroit-Beijing nonstop route was later launched by the merged Delta using a Boeing 777-200ER on July 1, 2011. In 2008, Northwest was one of several U.S. airlines to receive permission from the British government to fly into Heathrow Airport in London after previously having to use Gatwick Airport. Northwest began service to Heathrow from its hubs in Minneapolis and Detroit, as well as starting Seattle-London service. However, after being acquired by Delta in 2008, the Seattle route was dropped in January 2009 so the Heathrow landing slot and aircraft used could be redeployed to a more profitable route. In 2009, the Heathrow routes from the Minneapolis and Detroit hubs were taken over by Delta using its Boeing 767-400ER aircraft. Northwest Airlines also served more Canadian cities than any other U.S. carrier including Calgary, Edmonton, Kitchener/Waterloo, London (ON), Montréal-Trudeau, Ottawa, Quebec City, Regina, Saskatoon, Thunder Bay, Toronto-Pearson, Vancouver, and Winnipeg. Seasonal service was also offered to smaller Canadian cities. At the time of the merger with Delta Air Lines, Northwest had a total of 320 aircraft with seven on order. It was also the last U.S. passenger airline to have a dedicated cargo fleet and cargo-only routes. The Northwest fleet was integrated into Delta's fleet on December 31, 2009. Northwest operated a mixed fleet of Boeing, McDonnell Douglas, and Airbus aircraft whereas Delta operated just Boeing and McDonnell Douglas aircraft. The Boeing 757 was the only type common to the pre-merger fleets of both Delta and Northwest. As part of a major fleet renewal program, Northwest introduced a simplified new paint scheme and logo in 2003. The airline replaced its McDonnell Douglas DC-10 airliners with the Airbus A330. Its first Airbus A330-300, used initially for European flights, arrived on August 6, 2003. Northwest Airlines also possessed the youngest trans-Atlantic fleet of any North American or European airline. Northwest Airlines also began flying reconfigured Boeing 757–200 airliners on some of its European flights carrying fewer passengers. Northwest was one of only two passenger airlines in the United States to fly the Boeing 747-400, the other being United Airlines. Northwest was looking for manufacturers to discuss the replacement of their 100, 110 and 125 seat McDonnell Douglas DC-9 aircraft, with an average age of 35 years. In March 1988, Northwest Airlines announced that it would ban smoking on all flights within North America, effective April 23, 1988, on the same day that a rule from the U.S. federal government prohibiting smoking on all domestic flights or a duration of two hours or fewer, would take into effect. Northwest was the first major U.S. airline to enact a smoking ban since the airline Muse Air had ended its four-year smoking ban in 1985. World Business Class was the equivalent of business class on Northwest Airlines' international flights. It was available on Airbus A330, Boeing 747–400, and trans-Atlantic Boeing 757–200 aircraft. On Airbus A330 and Boeing 747–400 aircraft, seats had 60 inches of pitch and 176 degrees of recline. On trans-Atlantic Boeing 757–200 aircraft, seats had 60 inches of pitch and 178 degrees of recline. Passengers aboard this class received free meals and refreshments, including alcoholic beverages. All seats were equipped with Audio-Video-On-Demand (AVOD), universal power-ports, a moveable reading light, a folding work table, and a swivel cocktail table. Domestic First Class was offered on domestic flights. It was available on Airbus A319, A320, Boeing 757–200 (Domestic), 757-300 and McDonnell Douglas DC-9 aircraft as well as on board CRJ-900 Northwest Airlink flights operated by Mesaba Airlines and EMB-175 flights operated by Compass Airlines. Seats ranged from 19.5 to 21.5 inches wide, and had between 34 and 37 inches of pitch. Passengers aboard this class received complimentary meals, refreshments, and alcoholic beverages. Economy Class was available on all international flights. Seats ranged from 17 to 17.5 inches wide, and had between 31 and 34 inches of pitch. Passengers aboard this class received free meals, snacks, and non-alcoholic beverages. Beer and wine were complimentary on international flights with complimentary meals, other alcoholic beverages could be purchased for a fee. Passengers aboard Airbus A330 aircraft also had an Audio-Video-On-Demand (AVOD) system located in the seat back in front of them, and passengers seated in rows 10–23 (A330-200) or rows 10–28 (A330-300) had a universal power-port located below their seat. Economy Class was available on all domestic flights. Seats ranged from 17 to 17.5 inches wide and had between 30 and 34 inches of pitch, the same as on international economy class. Passengers aboard this class received free refreshments. Additionally, snack boxes, sandwiches (on select flights), and light snacks were available for purchase as part of a buy on board program. Alcoholic beverages were also sold. Before 2008, Northwest Airlines was the only major U.S. airline (aside from low-cost, short-haul Southwest Airlines, Allegiant Air and Spirit Airlines) to not offer any in-flight entertainment within North America (including Alaska). Although several of the airline's domestic aircraft were originally equipped with in-flight entertainment systems, these were removed in 2005 to cut costs. US Airways implemented a similar initiative in 2008. On flights between Honolulu International Airport and Minneapolis-Saint Paul International Airport, passengers experienced the same cabin as International Economy Class aboard Airbus A330 aircraft. Northwest Airlines' frequent-flyer program, WorldPerks, offered regular travelers the ability to obtain free tickets, First Class upgrades on flights, discounted membership for its airport lounges (WorldClubs), or other types of rewards. Customers could accumulate miles from actual flight segments flown or through Northwest's partners, such as car rental companies, hotels, credit cards, and other vendors. WorldPerks' elite tiers were Silver Elite, Gold Elite and Platinum elite which allowed for more mileage bonuses, priority wait lists and standby and other benefits. Over the years, some details of the program changed, such as introducing capacity controlled awards (only a certain number of seats allocated for free travel), expiration of account if no activity occurred in three years, requirement of a Saturday-night stay for domestic coach awards, waiving of capacity controls for awards but requiring double the number of miles for redemption, and adding several partner airlines for mileage accumulation and award redemption. The original name of the WorldPerks program was the Northwest Orient Airlines Free Flight Plan, which began in 1981. The original program used paper coupons and gave credit for flight segments. Upon renaming the program to "WorldPerks", a mileage-based system was used. WorldClubs was Northwest's member lounge. 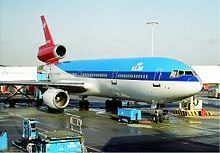 Members had reciprocal access to a number of other clubs, including fellow SkyTeam carriers such as KLM Royal Dutch Airlines, Delta Air Lines and Air France. 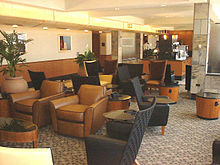 Northwest also had partnerships with various other airline lounges on an airport-by-airport basis. Unlike some other airline lounges, WorldClubs offered free alcoholic beverages in domestic locations and Tokyo-Narita. Northwest also offered free Wi-Fi internet access worldwide. The following are major incidents and accidents that occurred on Northwest's mainline aircraft. October 22, 1962 (1962-10-22): A DC-7 with 7 crew and 95 passengers made a successful water landing in Sitka Sound. The military charter flight was en route to Elmendorf Air Force Base from McChord Air Force Base and, prior to the ditching at just before 1 p.m. local time, the crew had been struggling with a propeller problem for about 45 minutes. The plane stayed afloat for 24 minutes after coming to rest in the water, giving the occupants ample time to evacuate into life-rafts. Only 6 minor injuries were reported; all passengers and crew were quickly rescued by U.S. Coast Guard ships. The accident report called the ditching "an outstanding feat," citing several key factors in this water landing's success: pilots' skill, ideal conditions (calm seas, favorable weather, daylight), time to prepare for the ditching and the military passengers' ease with following orders. Pilots who flew over the scene also praised the Northwest crew, calling it the "...finest ditching they had ever seen..." . July 1, 1968 (1968-07-01): Northwest Airlines Flight 714 was hijacked to Cuba. January 22, 1971 (1971-01-22): Northwest Airlines Flight 433 was hijacked en route from Milwaukee to Detroit, Michigan. The hijacker demanded to be taken to Algeria but the plane landed in Cuba instead. November 24, 1971 (1971-11-24): Northwest Airlines Flight 305 en route from Portland International Airport to Seattle-Tacoma International Airport, was hijacked by D. B. Cooper. After receiving a $200,000 ransom payment and four parachutes in Seattle, he ordered the crew to fly to Mexico, and he jumped from the aft airstairs of the Boeing 727–051 while it was in flight over Washington. The aircraft later landed safely in Reno, NV but Cooper's fate remains unknown. May 8, 1977 (1977-05-08): Northwest Orient Airlines Flight 22 was hijacked after taking off from Haneda Airport, Japan. The hijacker demanded to be taken to the Soviet Union but was taken down. January 4, 1990 (1990-01-04): Northwest Airlines Flight 5, a flight from Miami to Minneapolis, one of the three engines of the Boeing 727 aircraft fell off. The plane's crew, unaware that they had lost an engine, continued to fly for 25 minutes before making a safe landing in Tampa. March 8, 1990 (1990-03-08): a Northwest flight flew from Fargo, North Dakota, to Minneapolis with the entire cockpit crew legally drunk. All three pilots were subsequently fired and had their licenses revoked by the FAA. November 20, 1992. A 727 lost hydraulic power and made an emergency landing in Detroit with only engine power to steer the plane. January 2, 1999 (1999-01-02): (-Jan 3) due to bad weather and blizzards passengers were stranded on aircraft at Detroit for periods up to 8½ hours. An official inquiry found "... [the delays] were serious and indicate that this event had important implications for passenger safety. Moreover, even if the well being of passengers had not been an issue, the review team believes that the stranding of passengers on aircraft queued on taxiways for up to 8½ hours invites more serious problems and is simply unacceptable. None of the other airlines serving Detroit experienced ground delays approaching the magnitude of Northwest's delays." Subsequently, passengers brought various legal claims against the carrier including false imprisonment and negligence and obtained a $7.1 million settlement. October 9, 2002 (2002-10-09): Northwest Airlines Flight 85, a Boeing 747-400, experienced a lower rudder hardover during cruise. The crew declared an emergency and diverted the airplane to Ted Stevens International Airport in Anchorage, Alaska. June 19, 2004 (2004-06-19): pilots mistakenly landed at Ellsworth AFB instead of the nearby Rapid City airport. Passengers aboard were asked to close their window shades by US Air Force security personnel. May 10, 2005 (2005-05-10): a Northwest Airlines DC-9 collided on the ground with a Northwest Airlines Airbus A319 that had just pushed back from the gate at Minneapolis-Saint Paul International Airport. The DC-9 suffered a malfunction in one of its hydraulic systems in flight. After landing, the captain shut down one of the plane's engines, inadvertently disabling the remaining working hydraulic system. Six people were injured and both planes were substantially damaged. June 19, 2005 (2005-06-19): at 0435 in the morning Tehran local time, Northwest Airlines Flight 41, Ship No. 1243, operating from Bombay to Amsterdam made an emergency landing at the Mehrabad International Airport in Tehran, Iran. It was the first American air carrier to land in Iran in 26 years, since the Iranian Revolution in 1979. August 19, 2005 (2005-08-19): a Northwest Airlines 747-200, registration N627US, operating flight NW74 from Tokyo Narita Airport landed at Guam International Airport without its nose gear fully extended. The nose of aircraft made full contact with the runway. Smoke was reported on board and all passengers and crew were evacuated, with only two minor injuries reported. October 20, 2007 (2007-10-20): Northwest Airlines Flight 1432 executed an emergency landing at Hector International Airport in Fargo, North Dakota because the nose wheels had jammed in an abnormal position. There were no injuries on board. February 20, 2009 (2009-02-20): Northwest Airlines Flight 2, a Boeing 747–400 flying from Ninoy Aquino International Airport in Manila, Philippines, to Narita International Airport near Tokyo, Japan, experienced severe turbulence when descending to Narita. The aircraft, with 408 passengers and 14 crew members aboard, landed safely; however, 50 people were injured; around five were hospitalized. May 4, 2009 (2009-05-04): An Airbus A320-211, registration N311US, operated by Northwest Airlines as flight NW557, experienced a tailstrike resulting in substantial damage upon landing on runway 16L at Denver International Airport, Colorado (DEN). The flight was a regularly scheduled passenger flight which departed from Minneapolis-St. Paul Airport, Minnesota (MSP) at 11:39. October 21, 2009 (2009-10-21): Northwest Airlines Flight 188, an Airbus A320, flying from San Diego International Airport to Minneapolis-St Paul International Airport overflew the Minneapolis airport and continued to fly off course by 150 miles, leaving air traffic control to believe that the flight had been hijacked. The pilots originally stated that they were in an argument regarding airline policy and did not notice that they had flown off course, but later admitted to using their personal laptop computers at the time. The pilots contacted air traffic control after they realized their mistake and the flight arrived safely in Minneapolis about one hour late. The pilots' commercial flying licenses were subsequently revoked by the FAA. December 25, 2009 (2009-12-25): a Nigerian al Qaeda member tried to detonate plastic explosives on Northwest Airlines Flight 253, an Airbus A330 from Amsterdam to Detroit, as the plane was landing in Detroit. The device failed to detonate properly, and the suspect suffered third degree burns. Two other passengers incurred minor injuries. The White House said it considered it an attempted terrorist attack. ^ "AVIATION: Umbrella for Airplanes". Time. June 13, 1960. Retrieved December 3, 2017. ^ El-Hai, Jack (2013). Non-stop : a turbulent history of Northwest Airlines. ISBN 978-0816674459. ^ Letter from Northwest Archived April 17, 2008. ^ American Airlines, US Airways Complete Merger WSJ.com. Published 10 December 2013. ^ "Delta and Northwest Integration: Merger Updates". Delta.com. January 31, 2010. Archived from the original on December 21, 2014. Retrieved March 5, 2010. ^ "WATS Scheduled Passenger – Kilometres Flown". Iata.org. December 4, 2012. Archived from the original on November 4, 2013. Retrieved October 4, 2013. ^ "Scheduled Freight Tonne – Kilometres Flown". Iata.org. December 4, 2012. Archived from the original on October 6, 2013. Retrieved October 4, 2013. ^ a b c "Significant events in Northwest's history." Associated Press at MSNBC. September 14, 2005. Retrieved on January 11, 2012. ^ Ward, Paul W. "BIG AIR LINES PUT IN BIDS FOR CARRYING MAIL." The Sun. April 21, 1934. Start Page 1, 2 pages. Retrieved on January 11, 2012. 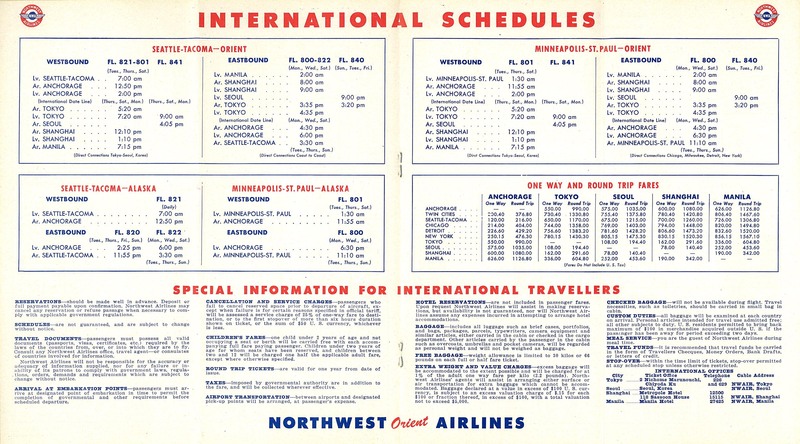 "Northwest Airways, Inc., which had a 4.69 per cent, slice of the 1933 air- mail business, reorganized as the Northwest Airlines, Inc., and bid to- day to[...]"
^ "1939 NWA timetable". Airchive.com. Archived from the original on March 20, 2012. Retrieved October 4, 2013. ^ First Commercial Flight from U.S. to Japan: July 15, 1947 (Northwest Airlines Website) Archived June 4, 2000. ^ "1947 timetable". Retrieved October 4, 2013. ^ "30% savings:". Spokesman-Review. Spokane, Washington. (advertisement). February 18, 1976. p. 6. ^ "Birth mark". Pittsburgh Post-Gazette. (advertisement). April 30, 1969. p. 5. ^ "McCartney, Scott. Airline passenger injuries from turbulence decline" (Archive) (The Wall Street Journal at the Pittsburgh Post-Gazette: May 3, 2005) "But the improvement comes from more than just buckling up. Northwest Airlines has been a pioneer in developing forecasting for turbulence and wind shear, and today Northwest sells its daily "turbulence plot" to several other airlines. Northwest is particularly interested in the issue because it flies so much in mountainous areas." ^ "Northwest Historical Timeline 1980's." Northwest Airlines. Archived June 19, 2000. ^ Moylan, Martin (October 30, 2008) Northwest Airlines – a look back at its long history. Minnesota Public Radio. ^ Ohanian, Lee E. (May 11, 2010). "Another Too Big To Fail Firm". Forbes. ^ Walters, Robert (October 2, 1986). "Trend toward monopolizing of the skies". Waycross Journal-Herald. p. P-3. ^ Dallos, Robert E. (February 19, 1986). "Proposed Northwest-Republic Deal : Justice Dept. Cites 'Concern' Over Air Merger". Los Angeles Times. ^ a b "Detroit Airport History". metroairport.com. Retrieved September 8, 2016. ^ "Northwest Airlines Chapter 11 Petition" (PDF). PacerMonitor. PacerMonitor. Retrieved June 9, 2016. ^ "Northwest Partner Files for Protection". The New York Times. October 14, 2005. Retrieved February 9, 2010. ^ "Northwest clear to exit Chapter 11". Startribune.com. May 19, 2007. Archived from the original on October 20, 2007. Retrieved October 4, 2013. ^ "Delta Air Lines Blog | Employees Celebrate Another Merger Milestone". Blog.delta.com. February 5, 2010. Archived from the original on February 14, 2010. Retrieved March 5, 2010. ^ Bartz, Diane (July 30, 2010). "Delta's Northwest pleading guilty to price fixing". Thomson Reuters. Reuters. Retrieved July 30, 2010. ^ a b c Grayson, Katharine. "Delta CEO: We'll consolidate MSP office space." Minneapolis / St. Paul Business Journal. Friday June 12, 2009. Last modified on Monday June 15, 2009. Retrieved on January 19, 2012. ^ Northwest Airlines Credit Application. Northwest Airlines. Archived January 2, 2010. ^ "NWA pilots threaten to oppose merger." Minnesota Public Radio. April 14, 2008. Retrieved on July 28, 2009. ^ a b c Feyder, Susan. "Delta Air Lines putting Northwest's onetime HQ up for sale or lease." Star Tribune. October 7, 2009. Retrieved on December 27, 2009. ^ "Delta puts Northwest headquarters in Eagan on the market." Minnesota Public Radio. October 8, 2009. Retrieved on February 1, 2011. ^ Niemela, Jennifer. "Delta reaches deal on Minnesota jobs." Minneapolis / St. Paul Business Journal. Tuesday December 16, 2008. Retrieved on January 19, 2012. ^ "delta air lines' farmers market-building c." Minneapolis-St. Paul International Airport. Retrieved on January 19, 2012. "Location: MSP Airport-Delta Building C, North Side near Compass Airlines Entrance"
^ World Airline Directory. Flight International. March 20, 1975. In 2011 Delta renewed the Northwest Airlines trademark while using a small NWA logo briefly on their website. The web names NorthWestAirlines.com, NWA.com and NorthWestOrient.com now rollover to the Delta website. 496. "Head Office: Minneapolis – St Paul International Airport, St Paul, Minnesota 55111, USA." ^ "World Airline Directory." Flight International. March 30, 1985. 104. Retrieved on July 23, 2009. "Head Office: Minneapolis-St Paul International Airport, St Paul, Minnesota 55111, USA." ^ "CASE STUDY: Northwest Airlines." Berkman Center for Internet and Society. Retrieved on November 29, 2009. ^ Northwest Airlines projects it'll be worth $7B post-bankruptcy Martin Moylan. Minnesota Public Radio. February 15, 2007. ^ Flight attendants reject new contract with Northwest Minnesota Public Radio Jul 31, 2006. ^ Judge rules Northwest flight attendants can strike Minnesota Public Radio Aug 17, 2006. ^ Northwest Walkout Is Blocked New York Times August 26, 2006. ^ U.S. Judge Prohibits Strikes at Northwest Washington Post September 16, 2006. ^ Published: March 12, 1993 (March 12, 1993). "Northwest Airlines Past Route To Australia". New York Times. Retrieved October 4, 2013. ^ "Northwest Airlines Announces Bid For U.S.-China Nonstop Service". Nwa.com. Retrieved October 4, 2013. ^ "Continental Airlines – Continental to Join Star Alliance – Frequently Asked Questions". Continental.com. Archived from the original on February 19, 2010. Retrieved March 5, 2010. ^ "Continental Airlines – Earn OnePass Miles on Airline Partner". Continental.com. Archived from the original on October 14, 2009. Retrieved March 5, 2010. ^ "Using Old DC-9s Pays Off for Northwest". Southernairways.org. Archived from the original on October 5, 2013. Retrieved October 4, 2013. ^ Kramon, Glenn. "Northwest Airlines Bans Smoking on Most Flights." The New York Times. March 24, 1988. 1. Retrieved on February 8, 2012. ^ "In-Flight Meals." Northwest Airlines. Archived October 26, 2008. ^ Northwest Airlines WorldPerks Program Information Archived March 12, 2009. ^ "Northwest Orient Free Flight Plan". Insideflyer.com. Archived from the original on May 25, 2006. Retrieved October 4, 2013. ^ Northwest Airlines WorldPerks Airline Partnerships Archived March 17, 2009. ^ Northwest Airlines WorldPerks Car Rental Partnerships Archived April 16, 2008. ^ "ASN Aircraft accident Martin 2-0-2 NC93044 Winona, WI". Aviation-safety.net. Retrieved March 5, 2010. ^ "ASN Aircraft accident Douglas C-54A-15-DC NC88785 Edmonton, AB". Aviation-safety.net. Retrieved March 5, 2010. ^ "ASN Aircraft accident Martin 2-0-2 NC93050 Minneapolis, MN". Aviation-safety.net. Retrieved March 5, 2010. ^ "ASN Aircraft accident Martin 2-0-2 NC93037 Almelund, MN". Aviation-safety.net. Retrieved March 5, 2010. ^ "ASN Aircraft accident Martin 2-0-2 N93040 Butte, MT". Aviation-safety.net. Retrieved March 5, 2010. ^ "ASN Aircraft accident Martin 2-0-2 N93054 Reardan, WA". Aviation-safety.net. Retrieved March 5, 2010. ^ "ASN Aircraft accident Douglas C-54E-5-DO N45342 Sandspit Airport, BC (YZP)". Aviation-safety.net. Retrieved March 5, 2010. ^ "ASN Aircraft accident Douglas DC-7C N292 Polillo Island". Aviation-safety.net. Retrieved March 5, 2010. ^ "ASN Aircraft accident Douglas C-54A-10-DC N48762 Missoula, MT". Aviation-safety.net. Retrieved March 5, 2010. ^ "ASN Aircraft accident". Aviation-safety.net. Archived from the original on May 8, 2008. Retrieved March 5, 2010. ^ "ASN Aircraft accident Boeing 720-051B N724US Everglades, Florida". Aviation-safety.net. Retrieved March 5, 2010. ^ "ASN Aircraft accident Douglas DC-7CF N290 Annette Island, AK, USA". Aviation-safety.net. Retrieved March 5, 2010. ^ "ASN Aircraft accident Boeing 727–251 N274US Stony Point, New York". Aviation-safety.net. Retrieved March 5, 2010. ^ a b "DCA91MA010A". Ntsb.gov. Retrieved August 17, 2012. ^ Aircraft Accident Report: Douglas DC-7C, N285 Northwest Airlines, Inc. Ditching in Sitka Sound, Alaska October 22, 1962. Washington, DC: Civil Aeronautics Board. September 19, 1963. p. 1. ^ "DC-7 Ditches In Sea Near Sitka; All Safe". The Seattle Daily Times. October 22, 1962. ^ a b Sims, Ward T. (October 23, 1962). "102 Saved As Plane Ditches". Seattle Post Intelligencer. ^ Aircraft Accident Report: Douglas DC-7C, N285 Northwest Airlines, Inc. Ditching in Sitka Sound, Alaska October 22, 1962. Washington, DC: Civil Aeronautics Board. September 19, 1963. p. 5. ^ "Hijacking". Aviation-safety.net. Retrieved March 5, 2010. ^ Weiner, Eric (January 5, 1990). "Jet Lands After an Engine Drops Off". The New York Times. Retrieved February 9, 2010. ^ Weiner, Eric (January 6, 1990). "Pilots Had No Way of Knowing Jet Engine Fell Off, Experts Say". The New York Times. Retrieved February 9, 2010. ^ Cushman, John (March 17, 1990). "3 Pilots Dismissed in Alcohol Abuse". The New York Times. Retrieved February 9, 2010. ^ "Report on the January 1999 Detroit Snowstorm". U.S. Department of Transportation. June 1999. Archived from the original on October 22, 2009. Retrieved June 2, 2012. ^ "Rudder hardover, Boeing 747–400". fss.aero Flight Simulation Systems. October 9, 2002. Retrieved June 2, 2012. ^ Harlan, Bill (June 21, 2004). "Landing incident prompts investigations". Rapid City Journal. Archived from the original on October 10, 2004. Retrieved April 6, 2008. ^ "NTSB: Pilot caused airport collision". Twincities.com. March 5, 2007. Retrieved April 5, 2015. ^ "Audio interview with Bo Corby, Captain of NWA Flight 41". Flightpodcast.com. Retrieved October 4, 2013. ^ Photos: Boeing 747-251B Aircraft Pictures. Airliners.net. Retrieved on February 14, 2011. ^ 胴体着陸 BELLY LANDING 緊急脱出 emergency exit. YouTube. Retrieved on February 14, 2011. ^ Yuasa, Shino (February 20, 2009). "50 hurt in turbulence on Japan-bound flight". Seattle Times. AP. Retrieved August 17, 2012. ^ ASN Aircraft accident Airbus A320-211 N311US Denver International Airport, CO (DEN). Aviation-safety.net. Retrieved on February 14, 2011. ^ "ATC fears NWA188 hijacked – CNN". Edition.cnn.com. Retrieved October 4, 2013. ^ Pilots in heated argument causing 150 mile off course – NTSB Advisory Archived December 6, 2009. ^ Maynard, Micheline (October 26, 2009). "Off-Course Pilots Cite Computer Distraction". The New York Times. Retrieved February 9, 2010. ^ Wald, Matthew (October 27, 2009). "F.A.A. Revokes Licenses of Pilots Who Missed Airport". The New York Times. Retrieved February 9, 2010. ^ "Officials: Possible terror attack on Northwest jet". MSNBC. December 28, 2009. Retrieved October 4, 2013. Roach, J and Eastwood A.B., Jet Airliner Production List - Volume 1 - Boeing. 2003. The Aviation Hobby Shop. ISBN 0-907178-97-9. El-Hai, Jack. (2013) Non-stop: A Turbulent History of Northwest Airlines (University of Minnesota Press, 2013) 291 pp. Heavily illustrated. Ruble, Kenneth D.; (1986). Flight to the Top: How a Hometown Airline Made History—and Keeps on Making It: The Absorbing Sixty-year Story of Northwest Airlines. New York: Viking Press. "Pilots Who Flew Drunk are Sentenced to Prison". (October 27, 1990). St. Louis Post-Dispatch, p. 7A. Retrieved March 21, 2005, from LexisNexis. Moylan, Martin J. "NWA to trim mechanics jobs". (March 17, 2005). Detroit Free Press. "Order 2006-2-1[dead link]", Joint Application of Alitalia-Linee Aeree Italiane-S.p.A., Czech Airlines, Delta Air Lines, Inc., KLM Royal Dutch Airlines, Northwest Airlines, Inc. and Societe Air France for Approval of and Antitrust Immunity for Alliance Agreements, United States Department of Transportation, February 6, 2006. Extensive archival records of Northwest Airlines are available for research use at the Minnesota Historical Society. Wikimedia Commons has media related to Northwest Airlines.